… And is Eligible for the ‘Spotlight Award’. Vote Now! Voting is open for the 2009 Ecotourism Spotlight Award. Government websites that educate visitors about ecotourism and responsible travel options are eligible. Vote ‘Mekong’ now. Nominees include the ‘Responsible Tourism Guide to the Mekong’ (Mekong Tourism’s PATA Gold Award-winning website), plus websites from Ireland, Laos, and Mexico. 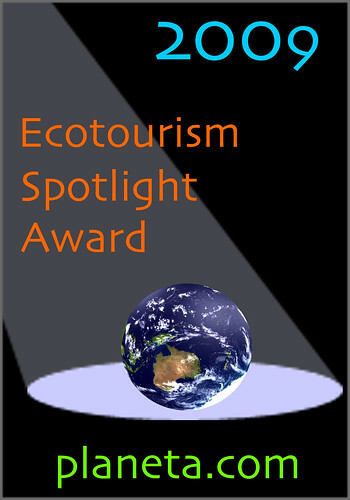 Unlike the PATA Gold Award, which was determined by a panel of expert judges, the Ecotourism Spotlight Award is based on a popular vote. Make your voice count: Vote ‘Mekong’ now. The winner will be announced in celebration of World Tourism Day (September 27) as way of spotlighting best practice in responsible travel and ecotourism.